INVESTING IN SURFACE TRANSPORTATION INFRASTRUCTURE SUPPORTS THE MOVEMENT OF FREIGHT AND GOODS: It also has the benefit of supporting economic development, jobs and quality of life. Panel discussion conducted in conjunction with Infrastructure Week, May 15 to 19. States have established freight plans as building blocks for a 21st century multimodal network. Everything from medications to automobiles and food moves on the freight network. In conjunction with Infrastructure Week (May 15 to 19), the American Association of State Highway and Transportation Officials (AASHTO), the American Association of Port Authorities (AAPA), and Congressional PORTS Caucus Co-Chairs Rep. Ted Poe (R-Texas) and Rep. Alan Lowenthal (D-California) held a panel briefing yesterday on an array of freight-related issues. Chief among them was implementation of the freight-related provisions under the Fixing America’s Surface Transportation (FAST) Act, the first long-term surface transportation legislation to authorize funds for freight mobility, providing $11 billion in 2015. Titled “By Road, Rail and Sea: Building a 21st Century Multimodal Freight Network,” the moderator was Port of New York and New Jersey Port Commerce Director Molly Campbell, and the panelists were Louisiana Department of Transportation and Development Secretary Dr. Shawn Wilson, Port of Port Arthur Deputy Port Director Larry Kelley, BNSF Railway Chief Legal Officer Roger Nober, and American Trucking Associations First Vice-Chairman David Manning. The panelists also covered other aspects of multi-modal freight infrastructure issues, ranging from enhancing rail access to dredging projects to accommodate larger ocean-going ships. 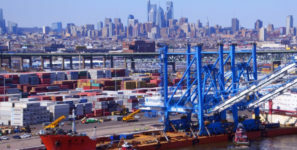 “We’ve got to maintain the FAST Act’s momentum by funding port-related infrastructure, including the connections on the land- and water-side to optimize the supply chain and enhance America’s competitiveness,” said Kurt Nagle, AAPA’s president and CEO. In December 2016, AASHTO and AAPA released the State of Freight II Report which shows that state departments of transportation are often the laboratory of innovation. Funding freight-related programs are no exception; with six states reporting at the time that they had some form of an authorized freight program, and 16 states, or 31 percent, reporting that they dedicate funding to freight projects annually. In a dynamic environment, port and state DOT officials need the funding and flexibility to adapt to new trade patterns in order to accommodate anticipated freight growth. Congress must continue to provide the resources to states for highway freight projects through the National Highway Freight program and fully enable tax revenues from the Harbor Maintenance Tax to be used for the intended purpose of navigation channel maintenance, as well as tax equity. AASHTO and AAPA will continue to gather input from the transportation industry and its partners in identifying infrastructure needs and advocating for solutions to build a 21st century freight network.